a later date are not offered for this design. 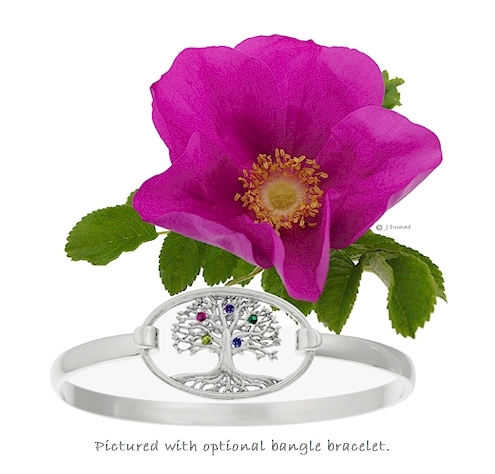 A colorful cord mothers bracelet with an open oval tree-patterned topper. 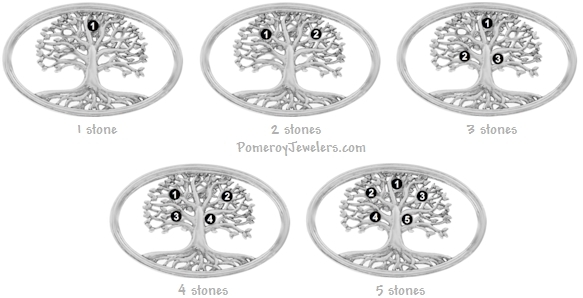 Tiny sparkling birthstones represent mom's family and are custom set in the branches of her family's tree. The sterling silver topper measures about 1 1/8" x 5/8". The bracelet cord is finished with a sterling silver clasp and catch. Beautifully produced by craftsmen in the USA. All bracelets come with a cord, optional sterling silver bangle also available for an additional fee. Other mothers bracelet toppers are also available- oval or swirl. 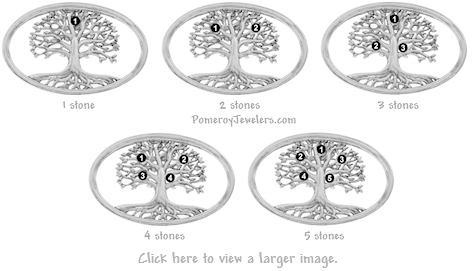 Custom made just for mom with from 1-5 stones. 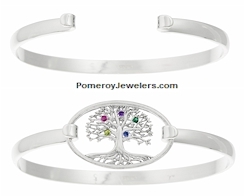 Tiny birthstones measure approximately 1.75mm in diameter. Choose either genuine stones or simulated stones. Most popular lengths are 6", 6 1/2", 7", 7 1/2", 8". Other lengths also available. 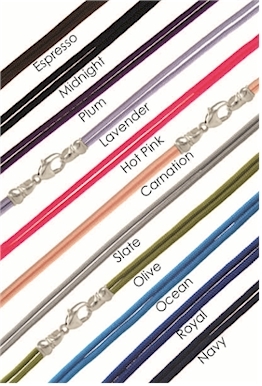 Choose from 11 bracelet cord colors. Each bracelet includes a cord but optional bangle also available for an additional fee. 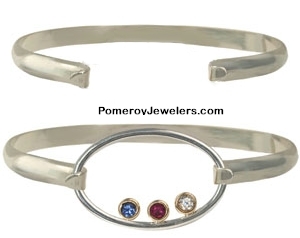 with option sterling silver bangle. Select Total Number of Stones. length of both the topper AND cord or sterling silver bracelet. CORD Bracelet- Included in price above. Additional fee applies. Select Total Bracelet Length. to the corresponding placement diagram on the left. Stone additions after purchase not offered. 2-3 weeks PLUS delivery time to you. has been added to the shopping cart. © Copyright 2003-14 J. Dunne. ALL RIGHTS RESERVED. Copying from this web site is a violation of copyright law. Pictures and content are for viewing only at this address and remain our property. They may NOT be copied, reproduced or modified in any form or manner. Use of this web site constitutes your agreement to our online store policies and terms. You must be at least 18 years of age to order from this store. We reserve the right to correct errors. Many of the items and designs are also copyrighted.